Princess Cruises and Fincantieri shipbuilding company announced today the signing of the final contracts for the construction of two next-generation cruise ships, which will be the largest ever built so far in Italy. Princess Cruises UK has announced the appointment of Liam Hunt to the position of territory business manager for Scotland and Northern Ireland. Princess Cruises has unveiled a dozen new ports for its 2019 schedule, including six in Japan. In an industry-first, events took place at Fincantieri shipyard in Monfalcone, Italy, to mark the construction progress for each of the 3,660-guest Sky Princess, Enchanted Princess and a sixth Royal-class ship yet to be named. Princess Cruises has announced the appointment of Ellie Webb as sales manager for its agent-facing regional business team. Starting on March 4th, Webb will manage five territory managers across the UK. Princess Cruises’ 2,670-guest ship, Diamond Princess, has received a multi-million-pound two-week refit. The ship now includes enhanced entertainment capabilities and an upgraded spa and gym. Throughout the year the 2,670-guest Diamond Princess will sail roundtrip from Tokyo and Kobe on over 50 departures to more than 50 destinations in 11 countries. Princess Cruises has announced a new wine list across its fleet of 17 ships. The new main dining room wine list, which took a year to develop, has doubled to include over 140 choices. Princess Cruises has announced the appointment of Rebecca Kelly to the newly-created position of senior sales manager for Ireland. Also today, Princess Cruises announced that Chinese guests onboard Ruby Princess have the option to utilise both Alipay and WeChat Pay payment options while shopping in the boutiques. Regal Princess will become the second ship in the Princess Cruises fleet to be fully-activated with the Princess Medallion. All 3,560 guests will have full access from February 17th next year, during the ship’s current Caribbean season. 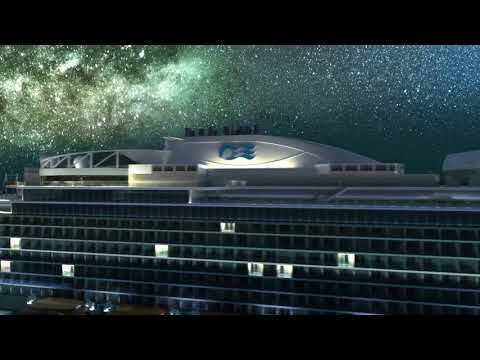 Princess Cruises has announced its fifth Royal-Class ship will be named Enchanted Princess. Princess Cruises has unveiled new details and features onboard the 3,600-guest ship Sky Princess, including the first-ever Sky Suites. The suites are centrally located on the top decks of the ship and have the largest private balconies ever offered by the line.